Trial version limits conversion to the first 30 seconds of each audio file. Helps you transcribe music by listening to your multiple-instrument CD audio, WAV, MP3, and WMA files and helps create multi-track MIDI (.mid) files containing the notes played broken down by instrument, chord names, and key. Then you can take those MIDI files and view the notation, change individual notes, and swap or mute instruments. You can also compose MIDI music in real-time by singing or playing any instrument. Posted by Anthony on Thu, 03/17/2011 - 14:15. Posted by pomus on Fri, 05/23/2008 - 09:38. Posted by program_sucks on Thu, 05/17/2007 - 23:34. Definatley not user friendly. Don't waste your time downloading it unless you are a musician. Posted by waldomiro aparecido da silva on Tue, 11/28/2006 - 09:31. Posted by waldomiro aparecido da silva on Tue, 11/28/2006 - 09:34. Posted by chric on Mon, 08/07/2006 - 09:20. Posted by farshid far on Thu, 05/12/2005 - 05:20.
which software converts midi files to style for yamaha keyboards? Posted by dzu on Tue, 05/24/2005 - 00:38.
: which software converts midi files to style for yamaha keyboards? Posted by bani on Sat, 04/02/2005 - 15:10. Posted by ddany on Sat, 09/18/2004 - 03:41. Posted by liqiang on Sun, 12/12/2004 - 01:54. Posted by xiaolin on Sat, 10/23/2004 - 05:21. Posted by xiaolin on Sat, 10/23/2004 - 05:22. Posted by joe on Sat, 08/07/2004 - 02:16. Posted by ddany on Sat, 09/18/2004 - 03:39. Posted by IntelliScore Support on Wed, 08/18/2004 - 11:01. 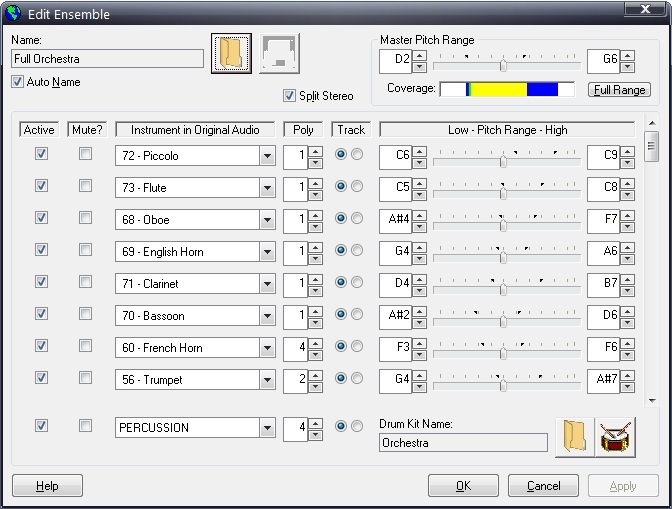 IntelliScore uses a feature called "patch maps" that assign detected notes to different instruments depending on their pitch. IntelliScore includes 25 patch maps, plus you can edit these and create your own. If you don't select a patch map, by default all the notes will be assigned to piano. This explains why there was only piano in your MIDI file. Posted by tayfun on Sun, 09/03/2006 - 01:39.
: IntelliScore uses a feature called "patch maps" that assign detected notes to different instruments depending on their pitch. IntelliScore includes 25 patch maps, plus you can edit these and create your own. : If you don't select a patch map, by default all the notes will be assigned to piano. This explains why there was only piano in your MIDI file. Posted by HEBINGWEI on Tue, 03/05/2002 - 11:20. Posted by frank galiansson on Sat, 01/20/2001 - 19:09. Pido a ustedes el favor de enviarme información acerca del programa que convierte wav a midi ya que es mi intención comprarlo, cuanto cuesta y como hago para adquirirlo. Posted by Joe Kohler on Sat, 02/17/2001 - 19:00. Thank you for your interest in intelliScore. Please visit http://www.intelliscore.net/order.html for ordering information. Thank you.